On a cold morning in early March, Toronto’s Gardiner Expressway is abuzz as commuters try to make it on time to wherever it is they are going. Inside a towering corporate office building just off Matheson Rd. in Mississauga, Marcia Trudeau, 40, is the first employee into work; she is the CEO of the North American Indigenous Games (NAIG) taking place in Toronto this summer. The Games represent a unique opportunity for the country to take another step towards the reconciliation that began with the Canada’s Truth and Reconciliation Commission‘s release of its Calls to Action in 2015. “Reconciliation is a two-way street,” according to Trudeau. “The Games give us the opportunity to expose non-Indigenous people to our culture.” She says that having the Games in a diverse, metropolitan city like Toronto presents a great opportunity for widespread promotion of Indigenous youth athletes, as well as the customs and traditions of the regions they come from. For many of the Games’ non-Indigenous attendees, it will be their first exposure to a strictly Indigenous sporting competition and the weight such an event holds for Indigenous people across North America. “There was always informal games taking place in our communities,” says Trudeau of her experience with sports as a youth. 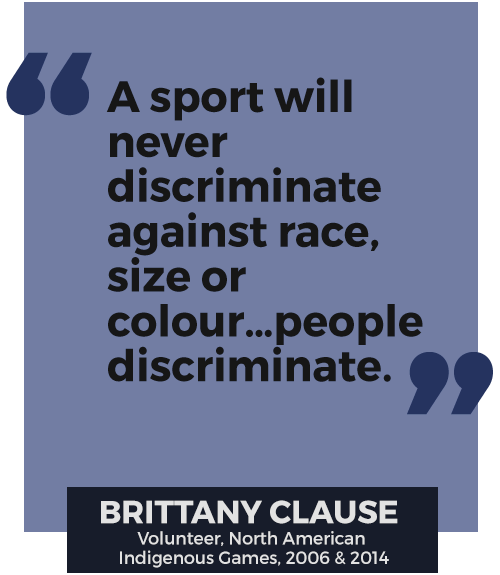 She says that is one reason she is proud to play an integral part in exposing many great Indigenous athletes to the world that may have not otherwise had the chance to be recognized. Kendra Potskin, 17, is such an athlete. She is one of seven girls from Prince George, B.C. who will be representing the province on its U19 volleyball team at the Games this summer. Potskin also participated in the 2014 Games in Regina on BC’s U16 volleyball team, which created exposure for her. “I’m going to be red-shirting next year for Douglas College,” she says. “Hopefully in a couple years I will be playing for them and at that level,” says Potskin, whose NAIG team coach also happens to coach the team at Douglas College. The direct benefits that the Games have on Indigenous youth were observed in a social impact study the NAIG conducted in 2014. Fifty-two per cent of participants in the study believed NAIG had an influence on their decision to pursue further education, while 97 per cent of participants indicated their intent to maintain a healthy diet post-NAIG. Furthermore, 69 per cent agreed the NAIG positively impacted the way that others perceived them. TRC Call to Action Number 88 specifically calls on the Canadian government to support Indigenous athletic competition such as the NAIG, stating: “We call upon all levels of government to take action to ensure long-term Aboriginal athlete development and growth, and continued support for the North American Indigenous Games, including funding to host the games and for provincial and territorial team preparation and travel.” The Canadian government has responded to the call so far, at least financially, with $7 million of the Games’ $10.5-million budget provided by the provincial and federal governments. I ask Trudeau if the government is doing more than just providing funding. “I think so, these Games are supposed to alternate between Canada and the U.S.,” she says. When the U.S. wasn’t able to formulate a plan for the 2017 Games, the Canadian government stepped in and offered to host, even though the most recent Games were held in Saskatchewan in 2014. “It really speaks to their commitment to the Call to Action,” says Trudeau. Some of the Games’ past participants aren’t so sure. The Games’ 14 sporting events will take place across the Greater Toronto Area and Six Nations from July 16-23 this summer. Unlike so many sports leagues in North America, the event has no economic incentive—admissions to all events are free. The event has a chance to be a stepping stone in the ongoing reconciliation process between Canada’s Indigenous and non-Indigenous populations by uniting people from different backgrounds to celebrate the athletes and communities of the latter group, who have long been marginalized in this country.